Aaron Muirhead post-Stenhousemuir: "It's the lowest I've felt after a game"
Falkirk defender Aaron Muirhead admitted that is the lowest he has felt as a player after crashing out of the Scottish Cup to Stenhousemuir. The Bairns, a division above their opponents, were expected to seal their place in the fourth round with something to spare, but instead were turned over by their part-time rivals in a 4-2 defeat at Ochilview. Paul Paton had given the visitors an early lead but Conor McBrearty scored two headers in four minutes to put Stenny ahead. Joe McKee levelled before second-half strikes from Sean Dickson and Mark McGuigan sent the Warriors through. Falkirk had made progress in recent weeks adding a stubborness and resilience to their defence, but it was a different type of game against the Warriors, with the onus on the Bairns to come out and attack. Muirhead questioned the mental strength of the squad after their “embarrassing” defeat. Muirhead says the players’ pride is at stake and they have a lot of work to do to get to the levels they were at previously. 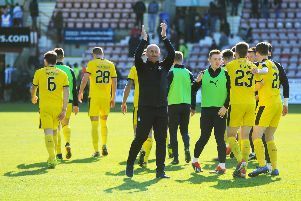 He said: “I just hope for not only the fans’ sake but the boys’ personal pride that we can go turn it around this weekend against Inverness because I was here when we got to the Scottish Cup final in 2015 – that is the memories that fans want, finishing second, final of the playoffs – things like that – not bottom of the Championship and getting knocked out of the Scottish Cup. There were contrasting emotions for young defender Conor McBrearty who celebrated scoring his first two goals in senior football in just his fifth appearance for Stenhousemuir. The 18-year-old is on loan from St Mirren and he was thrilled to have helped the Warriors into the fourth round. He said: “It was a wonderful feeling, I’m buzzing, it’s so good. I came into the game quite nervous, it was a big crowd and big occasion. It took a while acclimatise to it but when I got the goal it settled us down. “Everybody cares so much at this level, at Under 20s it’s all about development, a win in the Cup though and you can’t describe the feeling in that changing room.